60s wool Mink Fur Swing Dress Cape Mini-Coat Mini-Jacket. 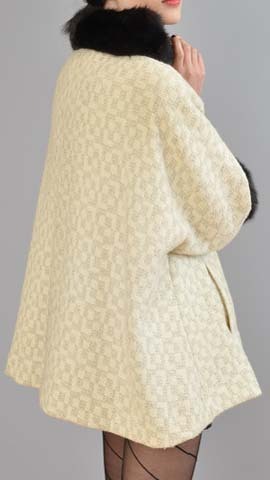 1960s wool swing coat. Thick ivory wool, grey geometric pattern. Ultra swing shape. Huge covered buttons. Half-length sleeves. Black mink fur collar and cuffs.